Some changes on my web site as well, it has a new store format, within each of the galleries, after clicking upon an image; you can access the shopping cart. This entry was posted in color inspiration, demonstration/creating mono-type prints, Kathleen Thoma Art Exhibitions, mono-type printmaking, printmaking, Printmaking in CA, Studio News and tagged Fine Art Hand-pulled monotype prints, KathleenThoma printmaking in California, monotype printmaking, printmaking in Orange County, Studio News on February 22, 2018 by Kathleen. After more than a year of trials and tribulations, I have relocated my studio, Kathleen Thoma Art, to Orange County, CA. I am very excited about the Irvine Fine Arts Center. They have a printmaking open studio available for artists to use. Last Wednesday, I decided to try it out and I was able to create a few images that I thought were worth my time. After a number of intense play/work hours, I ended up with a few things to show. What a background! I am gathering inspiration at the beach, really. I enjoyed meeting the wonderful people at the center and will certainly come again. Come again to see my work inspired by the amazing beauty and color of southern California! This entry was posted in color inspiration, mono-type printmaking, Nature as inspiration, printmaking, Printmaking in CA, Studio News and tagged CA, Kathleen Thoma Art relcocated to CA, printmaking in Orange County, Printmaking studios, Studio News on April 20, 2014 by Kathleen. Orange! Peach! I love shades of orange! Why do I love orange today? All I know is that right now, while working on this particular image; orange rules! Why? Orange makes me feel warm, happy, exuberant, communicative, sharing, open and relaxed. But why? The psychology of color is what I’m writing about here. This entry was posted in color choices, color inspiration, Color Therapy, mono-type printmaking and tagged color inspiration, color inspiration in monotype printmaking, color therapy, monotype printmaking on June 26, 2013 by Kathleen. It is fascinating to play with color while exploring new possibilities. There seems to be no end to the different combinations that are available to us. I particularly enjoy using complementary colors next to each other, which creates drama and excitement by bringing out what is the most vivid in each color. I am always looking for the “edge” between chaos and harmony with my colors. I am pushing the limits of color combinations; yet still creating what to me, at least, seems beautiful or wonderful. This entry was posted in color choices, color inspiration, mono-type printmaking, Nature as inspiration, printmaking and tagged Color inspiration from nature, color inspiration in monotype printmaking, complementary colors, monotype printmaking on March 13, 2013 by Kathleen. I am always finding abstract patterns in nature, I often use color for the starting point. Wing studies of birds, butterflies and other insects have a mysterious way of ending up in my sketchbook. I used the abstract patterns and colors from the wing study. Taken out of their original context, the image doesn’t make you think of butterflies at all. 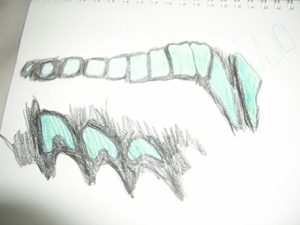 I’ve used the same colors as starting points in a number of variations, using the repetitions to create new patterns. Here is the finished monotype, which I’ve titled “Sea Flight”. This entry was posted in color inspiration, mono-type printmaking, Nature as inspiration and tagged Color inspiration from nature, color inspiration in monotype printmaking, Nature as Inspiration on February 12, 2013 by Kathleen. Where does color inspiration come from? 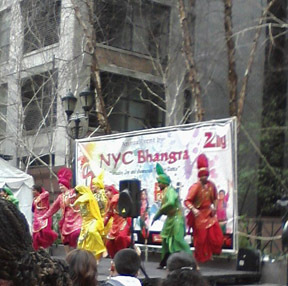 It seemed that a rainbow had exploded on the streets of New York city during the 2012 festival of Holi Hai. My family and I happened to be in New York City that day, and became curious about this ancient spring festival we saw advertised. Once we found it, we were glad. I feel it would be very difficult to remain in a bad mood for long in the midst of such a joyful music, dancing and singing. This entry was posted in color choices, color insights, color inspiration, mono-type printmaking and tagged color inspiration, color inspiration in monotype printmaking, Holi Hai Festival as inspiration for fine art on February 1, 2013 by Kathleen.